It goes without saying that Atari released the majority of the true classics during the Golden Era of arcade gaming. Hit after hit was created, manufactured and released. But it wasn’t easy. The challenge they faced was constantly having to come up with new concepts and ideas. If there was a flaw in their business model, it was that Atari were only as good as their last release. Unable to rest on their laurels when a big hit like Centipede was released, the pressure was constantly on to find what the next hit game was going to be, and to bet heavily on it by investing in marketing and production. Although Atari had many years’ experience in its favour, not to mention the biggest brand and some of the best programmers in the business, there was still a knife-edge element to the journey from idea to arcade. Atari was now big business, and with that came internal politics. Atari’s owner, Warner Communications, was always pushing for new product, incoming revenue and of course profit – this was what drove their stock price. Perhaps being detached from the day-to-day running of Atari’s Coin-Operated Division, they would likely not appreciate some of the nuances involved in the developement of new arcade games. But with one eye on the books, Warner Communications were hard taskmasters, and demanded a constant stream of quality releases from the Sunnyvale factory. They had paid good money for Atari, and wanted the cash-cow milked for every cent possible. Demanding a game within a certain time period would have been unrealistic – there may not be a game close to being finished; a programmer could only work so hard, and a rushed game might ultimately lose money if released without due care and attention. Scheduling releases vs the quality of those games would have been a huge headache for Atari’s management. Especially when dealing with Atari’s programmers, who had a healthy cynicism for the men in suits who ran the numbers of Atari’s business. I get the impression that making demands on Atari’s in-house engineers, programmers and project leaders would have been met with short shrift. They loved what they did, and didn’t really care about balance sheets or the pressures of corporate America’s boardrooms. Eyeing the recent success of Nintendo’s Donkey Kong and Nichibutsu’s Crazy Climber, Atari wanted to ride on this new platformer genre bandwagon, that was seeing considerable success in the North American market. Not seeing anything resembling a platform game in development in-house, a decision was made, presumably by the Sales & Marketing team, to find a platformer already developed by another company. That game turned out to be Kangaroo. Atari’s Kanagroo is an unusual release in that it was one of the few titles released under their name, but not developed by Atari themselves. The game puts the player at the controls of a mother kangaroo, who must climb ladders and platforms to rescue her joey son at the top of the screen. Along the way, monkeys and other enemies will throw bananas and other crap in an effort to scupper progress. It is regarded as a classic, due largely to the magnificent looking cabinet the game was housed in, but I personally think the game is awful – I’d say the present-day community is split equally about Kangaroo – there are some who do love the game. The licensing of arcade games was commonplace at this time – manufacturer Centuri made a business out of it, and released some of the best known titles of the era: Track n Field, Phoenix, Eagle, Circus Charlie, were all licensed games from other companies, usually Japanese companies with no presence in the US market. The manufacturer paid a fee to the creator of the game, which would secure them the rights to release that game in agreed markets. Kangaroo was developed by little known Japanese developer Sun Electronics. Seeing the game as an opportunity to acquire an arcade platformer without the costs (or time involved) of development, Atari negotiated a licence in the spring of 1982. On paper of course, it was a win-win. With no distribution logistics in the West (now a huge video game market) Sun Electronics could monetize their title by selling the game to Atari for cold hard cash – who in turn acquired a much-needed new title that they could drop into empty arcade cabinets and sell exclusively. The suits at Atari were pleased. This arrangement made perfect sense. The game was put out to field test for a week and received broadly positive feedback from players. This was good enough for the company under pressure to keep selling games. No sooner had the ink dried on the contracts, arrangements were made for production and marketing to begin. When you want a pouch full of profits, stick with the leader; ATARI! But of course, the release wouldn’t involve any of the programmers or designers employed within the coin-op division. Things were about to kick off. The Engineers of Atari were of course working on other games. Games they thought were quality products, and rightly they expected the support of Atari management when it came to shuffling these games along the development journey and out for production. For some, seeing Kangaroo arrive with some fanfare, get marketing backing based on minimal field testing and seemingly elbowing other in-house games out-of-the-way was just too much. Why am I working so hard to make a quality product? If you want to see and read the original two page memo in detail, you can do so here and here. 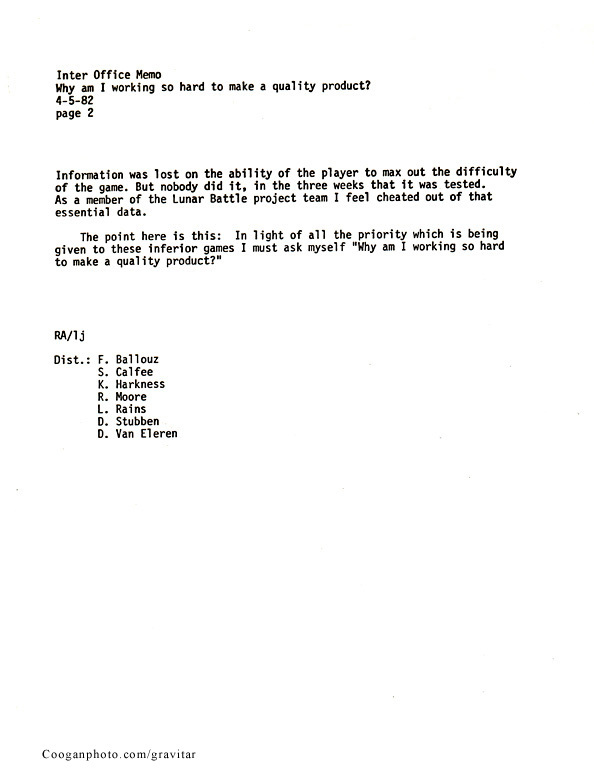 Dated 4th May 1982, he sent it to the top brass within Atari; to 7 people in total, including Frank Ballouz, Vice President of Marketing, and the heads of Coin-Op Engineering. There is an epidemic raging through the Coin-Op Marketing and Engineering Management staff. The disease is called License Fever. It destroys the brain cells of its victims, crippling their thought processes. These poor souls can no longer distinguish between a product that is junk and one that has the quality the public identifies with Atari. How could a healthy, logical person make a decision to build a game of the caliber of Kangaroo based on one weeks collections report? Such a decision must be the result of a severe cranial dysfunction. The impact of Kangaroo to Coin-Cops reputation is discouraging to think about. More serious however, is the impact n Engineering. The product teams that develop games here, work extremely hard. For these individuals to have to compete with trash games like Kangaroo……for engineering support creates a very real morale problem. So Adam decided to go there. He wrote down in black and white what effect the bulldozing through a new game developed outside of Atari was having on staff, struggling to get their games developed – and, sent the memo to senior members of staff. The mere consideration of these half-done games is confusing to engineers who are used to much higher standards. Result: even lower morale. Cleary having discovered the new game’s arrival at Atari’s offices, and playing it, Rich couldn’t believe what he was seeing. This sluggish game with graphics that clashed in places, the license made no sense to him at all. To have his product pushed to one side, so that Kangaroo would be rushed out was incomprehensible. The note is a fascinating insight into what Atari had become – essentially a “them and us” culture – there was clearly some resentment within the building, and this would have come with Atari becoming bigger and bigger, and accountability being spread more thinly across the organisation, resulting in those who built the business feeling they had less of a say to its ongoing future strategy. As is typical of large corporate environments, people felt less accountable and unheard. And Rich makes a great point in his memo – how can it make sense for Atari for buy in a new game rather than craft its own from scratch – a tried and tested formula that had worked so well for them since the mid-70s? It felt like corner cutting, at the cost of an inferior product. It didn’t end there either. Sun Electronics also sold the license to its Arabian arcade title a few months later. But it’s worth pointing out that not all games that Atari decided to licence around this time were as poor in gameplay terms as Kangaroo. Namco’s Dig Dug and Pole Position spring to mind. Both were big hits respectively. But despite all the venom directed at Kangaroo and what it represented internally at Atari, it was actually a success. Over 9,803 cabinets were produced and sold (and ironically compare this to the number of Rich Adam’s game Gravitar that were eventually produced – just 5,427). Kangaroo was even syndicated as a Saturday morning kids cartoon on US TV networks in 1982! Not bad for a title regarded as “half-done” by Rich Adams himself, and as “awful” by the idiot penning this article. Maybe Rich and I were wrong? There’s no accounting for taste I suppose. So, Atari Kangaroo. Check it out on MAME if you can and see what you think. It’s a quirky game for sure, if for no other reason than it caused quite a stir internally at Atari. For a more in-depth look at Kangaroo‘s cabinet and gameplay, check out this excellent video. Thanks to Dan Coogan and his excellent Gravitar website. 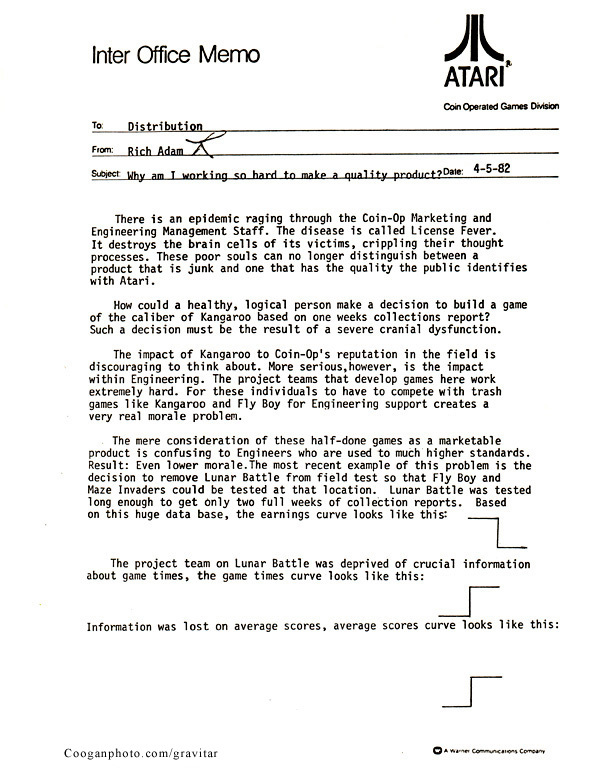 His published Atari documentation about Gravitar (and Rich’s memo specifically) formed the basis of this article. Previous Post Atari Steeplechase: Weekend Pickup! i vaguely remember Kangaroo, but i have deep, fond memories of Gravitar. to this day, it’s one of those games that hits a deep nostalgic vibe in my heart. I don’t think Rich Adams was wrong at all… as evidenced by what happened to Atari later. I actually thought the game was pretty cool as a kid. Not sought out a ton I know, but if I came across one fairly cheap, I’d pick one up. I can see where Rich was coming from though. …He likes the classics, Donkey Kong, Pac-man and all, but he once came across Kangaroo and he can’t get enough!! Personally, it has that ‘not quite finished’ feel to me, and watching the Atari advert, it becomes a tad complex for the casual player. (That Super-Leap move leave is an arse to get pixel-perfect on level 2!). Funny, for as weak as Kangaroo was, I didn’t think Gravitar was any better. Granted it looked great and was enticing but the end result was meh. Curses to you sir! May a million bees be found in your bottom tomorrow morning! Kangaroo is a beautiful game (if a little bit crap) How can you not llike that floppy, clumsy daft momma kangaroo? Oh by the way, the monkeys NEVER chuck nanas. Only apples. Weird, as everyone knows that nanas are like crack for all monkeys. Check out the upcoming review on ten pence arcade podcast #99. Sorry about the bees.